The Nobis Quoque Peccatoribus (“to us likewise sinners”) prayer of the Roman Canon refutes the Modernist teaching that everyone goes to Heaven; that we are all living saints on earth. Modernists do not have a sense of sin and redefine Church doctrine to make the worst of sinners feel proud and at peace with their shameful sinful lifestyles, and open to accepting false religions. To them, “S” is for “Saints” – no matter what you do or what religion you hold, ‘We are all going to Heaven!’ (Syllabus of Errors, Great Blessed Pope Pius IX, #15-18). This heretical thinking does not produce Saints: brave souls willing to die believing, defending, practicing and spreading the One, Holy, Catholic and Apostolic Faith. Pope Saint Pius X warned of this Modernist assault on our Faith in Pascendi Dominici Gregis when he said: “…animated by a false zeal for the Church, lacking the solid safeguards of philosophy and theology, nay more, thoroughly imbued with the poisonous doctrines taught by enemies of the Church, and lost to all sense of modesty, put themselves forward as reformers of the Church; and forming even more boldly into line of attack, assail all that is most sacred in the work of Christ…” (Pascendi #2). As members of the “Church Militant,” we on Earth must fight against the forces of evil, the enemies of our Faith, to have any hope of winning the struggle to save souls, including our own. Paraphrasing Saint Paul: we must fight the good fight; we must finish our course; we must keep the Faith (2 Tim 4:6). The “Church Triumphant,” the Saints in Heaven who have prevailed in the spiritual combat while on Earth, help us to reach eternal glory by their prayerful intercession and holy example. This article is part of an ongoing Remnant series called "Traditional Latin Mass 101", by Father Ladis Cizik. It appeared back in July of this year. Imagine how many great articles you're missing if you're not yet subscribed to The Remnant. The Nobis Quoque Peccatoribus gives us fifteen especially venerable martyred Saints to assist us: eight male and seven female – all of whom were prepared to fight against sin and to suffer any adversity rather than deny the Faith. Among those were various ranks of believers: Prophet, Deacon, Apostle, Bishop, Pope, Priest, Exorcist, Married, Mother, Single, Virgin and Widow. All died prior to 305AD, an indication of the antiquity of this prayer from the Roman Canon. As the Roman rulers were the preeminent enemies of the Catholic Faith back in their day, so today is the Church especially attacked by Modernists under whom we now suffer; with new martyrs, of a different sort, fighting for their spiritual lives every day. Saint John the Baptist (died 30AD) is first on the list, and especially appropriate today as the teaching of Christ and His Church on marriage is currently under attack by Modernists. This last of the Old Testament Prophets was beheaded by the Roman appointed Tetrarch of Galilee and Perea, Herod Antipas, for defending the sanctity of marriage; for courageously publicly opposing Herod’s adulterous attempted marriage to another man’s wife. 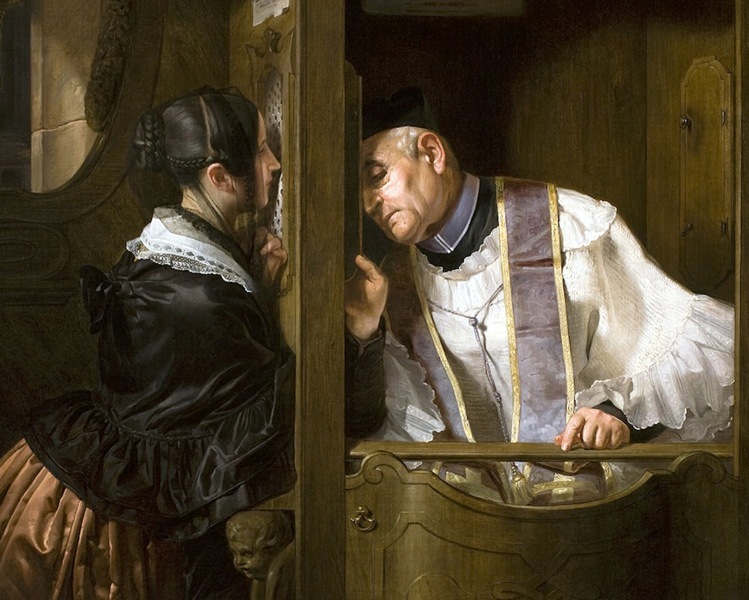 John’s words of truth, for which he died, resonate today in the battle with Modernists over the Sacrament of Marriage: “It is not lawful for thee to have thy brother’s wife” (Mk 6:18). Feast days: Birth - June 24; Death - August 29. Saint Stephen (died 34AD), a Deacon, was the first Martyr of the Church. Scripture says that the Jewish enemies of the Church disputing with him were not able to overcome the wisdom and the spirit that Stephen spoke with and they set up false witnesses against him (Acts 6: 10 - 14). Stephen was stoned to death by those who falsely claimed to be serving God, just as traditional Catholics are assailed in various ways by Modernists today. Feast: December 26. Saint Matthias the Apostle (died 1st century) was selected to replace the traitor Judas among the first ‘college of bishops.’ May all of today’s ‘successors to Judas’, who betray Christ and His Church, be replaced with such worthy men as Matthias. He is said to have been martyred for upholding the Divinity of Christ, which the Modernists deny in so many different ways (see Pascendi #9 and Lamentabili, Pope Saint Pius X, #27). Feast: February 24. Saint Barnabus the Apostle (died 1st century) is ranked by the Church as an Apostle, though not one of the twelve. Born with the name of Joseph, the Apostles gave him the name Barnabas (“Son of Exhortation/Consolation”) because of his courage and conviction to speak the fullness of the Faith. He and Saint Paul brought in many converts to the Faith from among the Gentiles. Both won the crown of martyrdom as champions of ‘proselytization.’ They brought many souls to the One True Church founded by Christ, a term which Modernists decry today as ‘Triumphalism’ (Lamentabili # 52). Feast: June 11. Saint Ignatius of Antioch (died 107AD) was that courageous Bishop who, being led to his martyrdom in Rome, said: “I am the wheat of God and must be ground by the teeth of beasts, so as to become the pure bread of Christ…Better it is for me to die for Jesus Christ than to reign over all the bounds of the Earth.” On the other hand, Modernists value most the things of this world and center their ‘worship’ on man, rather than Almighty God; they favor the rights of the civil secular state over the Church (Syllabus of Errors #19-20). Feast: February 1. Pope Saint Alexander I (died 115AD) was the fifth Pope after Saint Peter. He is said to have been subject to the rack, hooks, and flame and was finally beheaded outside of Rome, along with two of his priests: Saints Eventius and Theodulus. Death was preferred by these spiritual fathers to any possible denial of the One, Holy, Catholic and Apostolic Faith. Modernists prefer to deny the Faith rather than offend humanity (Lamentabili #58). Feast: May 3. Saint Marcellinus (died 304AD) was a Priest who baptized the family of the jailer who was converted to Catholicism by his prisoner, Saint Peter the Exorcist. As a consequence of their holy ‘proselytization,’ Saints Marcellinus and Peter were frightfully tortured and led out of Rome into a forest where they were beheaded. In today’s climate of Modernism the holy idea of converting an entire family or even an individual to Catholicism would be termed “solemn nonsense.” Feast: June 2. Saint Peter the Exorcist (died 304AD), while in prison for the Catholic Faith, delivered the daughter of his jailer from an evil spirit. The jailor, Artemius, and his family then converted to Catholicism and were baptized by the priest, Saint Marcellinus, mentioned above. In order to save souls, by bringing them to the One True Faith founded by Christ, Saints Marcellinus and Peter gave up their lives on Earth to win the Heavenly Crown of Glory. This is in contrast to the Modernists who lead us to believe that all existing religions are equally true (Pascendi #15). Feast: June 2. Saint Felicitas (died 203AD) was a Married slave who was thrown into a filthy, dark and smoky prison for having converted to the Catholic Faith in the Roman province of Carthage, North Africa. While incarcerated, she gave birth to a daughter while surrounded by the insults of her impious jailers. Whereas her newborn daughter was promptly adopted by non-imprisoned Catholics and survived, Felicitas shared this prison and her fate as a Martyr with Saint Perpetua. Feast: March 6. Saint Perpetua (died 203AD) was a Married woman and mother of noble birth, who was imprisoned by Roman authorities for converting to the Catholic Faith along with Saint Felicitas. Perpetua was permitted to nurse her little son in prison, as her father implored her to apostatize. Holding firm to the Catholic Faith, Perpetua, along with Felicitas, were savagely scourged before being thrown before a wild heifer in the amphitheatre. After surviving these cruelties willingly for the glory of God and the salvation of souls, they were beheaded. Feast: March 6. Saint Agatha (died 253AD) was a Virgin, having chosen Jesus as her Spouse from her childhood. Known for her beauty, wealth, nobility and virtue, she was accused of being a Christian after rejecting a Roman Prefect’s advances and thrown into a Sicilian prison in a bid to have her deny her Faith. In her unholy captivity, she endured the rack, iron hooks, fire, and having her breasts cut off. She was healed during a vision of Saint Peter the Apostle, who miraculously appeared to her in prison. She was then rolled on sharp potsherds mixed with burning coals. As a result of her satanic trials, she died in prison in Catania, Sicily. Feast: February 5. Saint Lucy (died 304AD) was a Virgin who made a vow of perpetual chastity to the Lord at an early age. Brought before a judge, having been accused of being a follower of Christ, she refused to save her life by offering sacrifice to the false gods of the Romans. Enraged, the judge tried to send her to a brothel, but no earthly power was able to move her, not even a team of oxen. A fire was built around her, but she was unharmed. Her eyes were gouged out, and still she did not waver in her Faith. Finally a sword was plunged into her neck, but she did not die until she had consoled the Catholics around her, and not before receiving Viaticum from the hands of a Priest. When her body was prepared for burial, it was discovered that her eyes had been restored more beautiful than before. Considering that Modernists routinely disbelieve in miracles, they would severely edit out or belittle the supernatural elements of this heroic account (Syllabus of Errors #7). Feast: December 13. Saint Agnes (died 304AD) was a Virgin who was martyred at the tender age of thirteen. Saint Jerome noted: “Truly responding to her name (agnus = lamb), she passed her childhood in spotless purity and lamblike innocence.” Accused of being a follower of Christ and refusing to sacrifice to the Roman gods, it is said that she was sentenced to be dragged naked through the streets to a brothel, but her hair miraculously covered her body. All of the evil men who tried to violate her were immediately struck blind. Led out to the stake to be burned alive, she was unharmed. Finally, she was beheaded. Before her tomb in Rome at the Church of St. Agnes Outside the Walls, two white lambs are annually blessed on the anniversary of her death (January 21) during the singing of the Agnus Dei. The wool from these lambs is used to make palliums for Archbishops. Feast: January 21. Saint Cecilia (died 2nd- 3rd century) was a Virgin who consecrated herself to perpetual chastity at an early age. Commanded by her parents to marry a Roman pagan who was wealthy, Cecilia’s Guardian Angel assured her that God would preserve her virginity even after the ceremony. Accordingly, her “husband,” along with his brother, converted to Catholicism after the wedding – and were soon beheaded. Saint Cecilia was subsequently ordered by the Roman prefect of the city to be suffocated in the Caldarium (bathroom) of her palace. Surviving this attempt on her life, an executioner was sent who struck at her neck three times, without severing it. She lived on for three days giving counsel to those who visited her. Her incorrupt body, still in the position in which she died on the floor, was originally interred in the Catacombs of St. Callistus and then transferred to the Church of St. Cecilia in Trastevere. She is known as the patron of musicians, for as they performed at her wedding, Cecilia “sang to the Lord in her heart.” Feast: November 22. Saint Anastasia (died 304AD) was a noble Roman Widow, whose pagan husband died during a violent storm. Then, free to practice Christian charity, she traveled to Sirmio, within the Roman Empire, where she helped Catholic prisoners endure their suffering. She was arrested, refused to renounce her Faith and was placed on a damaged ship with a number of pagan criminals under the death penalty to sink and die at sea. The distressed ship, however, miraculously made its way to the Roman controlled island of Palmaria on December 25, 304. There, she and all the prisoners, who had by then converted to Catholicism, were killed. With arms and legs outstretched, Anastasia was “crucified” by being staked to the ground with four poles, was burned, and finally beheaded. She was so influential in Rome that the Pope, at one time, used to offer the second Mass of Christmas day in her church: the Basilica of Saint Anastasia on the Palatine Hill. In keeping with this venerable papal devotion, the Traditional Latin Christmas Mass at dawn still commemorates Saint Anastasia. Feast: December 25. For us sinners struggling for Sainthood, we should attend and promote the Traditional Latin Mass and keep the Faith, as did our martyred spiritual heroes. Contrary to the continual heresies uttered by the Modernists, know that the religion of the Catholic Church, the Faith that our Martyrs in the Nobis Quoque Peccatoribus died for, is the only true religion (Syllabus of Errors #21). Never become discouraged and always remember my Three R’s of Modernism: Recognize it; Refute it; and Return to Tradition.